Reformed Fatty! : Row, Row, Row, your...uh Rower? With the amount of rain we got here in PA over the past month or so, you'd think we could do more of our rowing in a real boat. 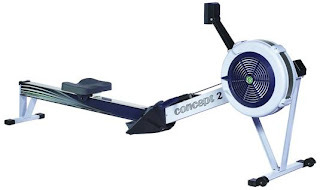 That was not the case at CF610 last night where part of the WOD was to complete a 2000m row. Now, I am not a bad rower but I don't think I'm good either. My goal was to get under my PR time of 7:48. After the first 1k, I felt great and was well under my goal time, in fact if I was able to keep the same pace I would have been close to 7:15. When I was done, I came in at 7:30.9. A WHOLE 18 SECONDS BELOW MY PREVIOUS PR! I was pretty psyched. I think I'm pretty good at it because of how much time Mike had me on the thing during the biggest loser competition. I was doing 1-5k a day during that period. Looks like it has paid off a bit. I now have yet another goal. I think I need to make a page that lists my goals and the progress toward those goals. Until that is made, here is me using theory in practice. I am going to SMART this goal. I think this is attainable. The best time at the gym was 7:16 and I need to shave 30 seconds off my time to accomplish it. It will not be easy at all. But it is doable with devotion. Yes, it is relevant to my overall fitness goals. It is not just some random idea. This is the tough part. I need to choose a time frame that make the goal attainable. I want to say the end of the year, but that means taking off 10 seconds a month so I am going to say by the end of February 2012. Now for the questions part. I will try to row a 1k every day at the gym. That means 4 minutes on the rower a day. Which is nothing time wise. That is what CrossFit is all about, I will have help from my wife, my trainers, and the rest of the box. Just the rower and some devotion. Every time I'm at the gym. And I will try to do a 2k row every 3 weeks to gauge my progress. Cause it will make me pretty effing awesome on the rower. I believe it will put me #1 on the box list as well. Let's hope I can get this going! 100 ring dips counting the number of sets and number of time.